Are Compact Fluorescent Light Bulbs a New Cancer Risk in Your Home? The Energy Independence and Security Act of 2007 (EISA) has mandated the phase-out of incandescent light bulbs, and favours energy-efficient compact fluorescent light (CFL) bulbs instead. Sounds good – until you realize that CFL bulbs contain mercury, and mercury poses a significant cancer risk. A new study (find it at http://bit.ly/W74NRk) shows that CFL bulbs also emit high levels of ultraviolet radiation – specifically, UVC and UVA rays. In fact, the UV rays are so strong that they can actually burn skin and skin cells. Experts say the radiation could initiate cell death and cause skin cancer in its deadliest form – melanoma. In every bulb the researchers tested, they found that the protective phosphor coating of the light bulb was cracked, allowing dangerous UV rays to escape. Healthy skin cells exposed to CFLs showed a decrease in their proliferation rate, an increase in the production of reactive oxygen species, and a decrease in ability to contract collagen. General Electric claims that CFLs don’t produce a hazardous amount of UV radiation, and that UV is far less than the amount produced by natural daylight. The truth is that all compact fluorescent lights bulbs contain mercury vapour. Once that vapour is hit with an electric current, it emits a great number of UV rays. 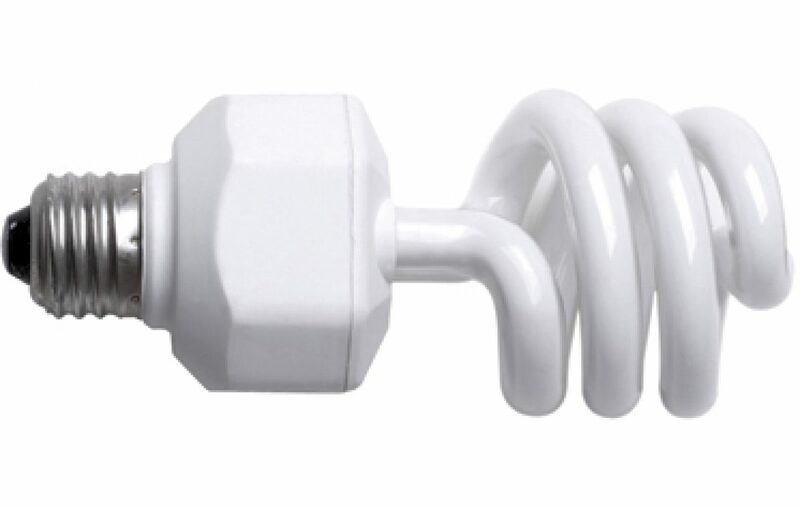 UV rays are theoretically absorbed by the layer of phosphor that coats the bulbs – but the signature twisted spiral shape makes these bulbs more prone to cracks in the phosphor, which dramatically increases UV/mercury exposure. Researchers found cracks in almost all bulbs purchased from retail stores, indicating that it is a standard design flaw of these bulbs. And what if the bulbs break? On top of that, it’s a sad fact of life that light bulbs break. How do you clean up the mercury after a bulb breaks? The Institute for Molecular and Nanoscale Innovation measured the release of mercury vapour from broken compact fluorescent bulbs. They recorded concentrations near the bulb of up to 800 mcg/m3, which is eight times the average eight-hour occupational exposure limit allowed by OSHA (100 mcg/m3). Even more shocking, the recommended limit for children is a mere 0.2 mcg/m3. A child exposed to a broken CFL bulb will receive eight thousand times the recommended amount of mercury vapour! A broken 13-watt CFL bulb will only have released 30% of its mercury a full four days after it is broken – the remainder is trapped in the bulb. So picking up shards with your bare hands or leaving them in poorly ventilated room while you ponder the best disposal method is a particularly bad idea. Unfortunately, there is no good solution for cleaning up after a broken CFL bulb. Researchers at Brown are testing a cloth made with a nanomaterial (nanoselim) that can capture mercury emissions for proper disposal. But until this is commercially available, it is best to avoid CFLs altogether. And how will we dispose of the clean-up cloth? We’re happy that the U.S. government is tackling environmental problems, but this “solution” is especially short-sighted – and not unlike the national smart meter push, is creating serious health risks in the long-term. Worse, soon consumers won’t have the option to buy incandescent lights – they simply won’t be available. The government hasn’t placed an outright ban on incandescent light bulbs. Section 321 of EISA mandates higher efficiency standards for general service lamps. But these standards are high enough that most commonly used incandescent bulbs just won’t meet the new requirements. EISA will effectively eliminate 40-, 60-, 75-, and 100-watt incandescent bulbs. The new efficiency levels will be in full force by 2014. The good news is that CFLs are not the only energy-efficient bulbs out there. There are also light-emitting diodes (LEDs), which are mercury-free – though LEDs emit blue light, which can be disruptive to sleep, as we noted in our 2012 article. Please contact your legislators immediately and call for a repeal of the ban on incandescent lights. Tell them about the cancer risks and the lack of proper disposal methods. Please take action today!